Everyone needs fun and friendship. Help us make it happen for older people at Time & Talents. Could you help bring a community to life, creating fun, friendship and mutual support for older people? How about, say, integrating NHS health advice with a mobile zoo day, or a birthday party for over 90s? If so, read on. We’re seeking someone with creative flair, excellent organisational skills, and a passion for community, to run our groups and activities for older people at Time and Talents. At Time & Talents, we believe that fun, friendship, and mutual support create a happy, healthy community, where everyone is included. But older people very often get left out: their friendships and networks disappear, family and friends move away, and they can end up very lonely and isolated. Once that happens, mental and physical illness too often follow. At T&T, we create ‘circles of support’, which surround older people with a welcoming, nurturing community, to improve and maintain their wellbeing. We’re increasingly known as an innovator in older people’s community work, from our Pub Club and Men’s Shed, to our Cycling Without Age initiative. We work with around 250 older people a year, many of whom are very frail and elderly, offering one to one support and caseworking, befriending, and an exciting programme of social and support groups with fully escorted transport. 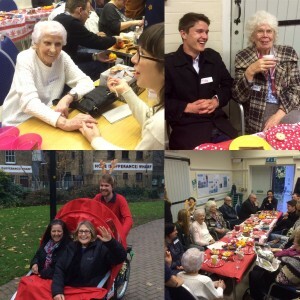 We also run fun events and intergenerational work to bring the whole community together. 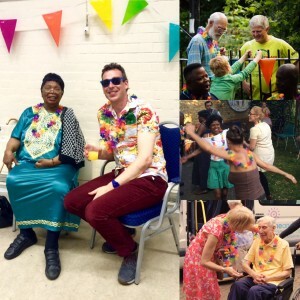 Last year we had a ‘People’s Ninetieth Birthday Party’ for everyone over 90 in Southwark, a Tropical Paradise barbecue, and a visit from a skunk, a meerkat and a boa constrictor to our over 60s Happy Mondays group. From reminiscence, to health and wellbeing advice, to outings to new and exciting places, no two days are the same. It’s hard work, but very rewarding. To get more of a flavour of what we’re about, see our video page. In this role, you’ll deliver some of our existing large groups, including Happy Mondays (a fun, challenging, activity group designed for older people experiencing or at risk of depression), a biweekly Visual Impairment group, and after training, a lively Stroke Club, working with an occupational therapist. With the support of volunteers and community members, you’ll coordinate other smaller peer-led and tutor-led groups (from Tai Chi to a mental health support group for older women). And this year, an exciting new project will be to set up our first drop-in activity day, Funday Fridays, to attract a whole new range of older people. A key part of the role is involving older people themselves in the delivery of the programme as volunteers, and involving people of all ages from the local community – from NHS health professionals to local artists and students. You will also need to build individual relationships of trust with older participants, and work closely with our case worker to ensure we take a joined-up approach to caring for individuals. Most of all, we need someone who cares deeply about older people and their welfare, and is able to react quickly and appropriately to emerging issues – especially to the more serious care issues we inevitably encounter. While appropriate training will be given, we would prefer candidates with some social care experience. The role needs someone creative, energetic, passionate, but importantly, also highly organised. You must be as comfortable making sure a minibus schedule is up to date, as you are delivering craft activities or quizzes, or as comfortable hosting NHS professionals delivering advice on cancer screening, as you would be helping run an escorted visit to a local farm. You need to have lots of ideas, and be highly ambitious but also be able to make your ideas happen. We’re based in the tranquil oasis of a beautiful heritage building (an old mortuary – nicer than it sounds!) surrounded by mature gardens in Rotherhithe, South East London. You’ll be surrounded by a team who is just as energetic and passionate as you are, with a lively sense of humour, and a huge amount of experience to learn from. We also consume more cake and biscuits per capita than any other voluntary sector organisation in the UK – FACT. You’ll have the chance to make a big contribution to an organisation which has doubled its reach and impact over the last 2 years, and will be joining us at an exciting time, when we’re poised to expand our offer and make a bigger difference than ever. Please send your application as soon as possible, and no later than 22nd May 2017. Salary: £25-27k per annum based on experience, plus 5% matched employer pension contribution. Hours: 37.5 per week. Based: Rotherhithe and Bermondsey.